Back in the Dark Ages of the 1980’s, when I was a rookie, there was pretty much one standard knife carried by police officers and that was the now-venerable Buck 110. Along with a revolver, the sturdy lock back folder went in its leather pouch on an officer’s duty belt. The one-handed opening pocket knife had not yet been popularized. A new cop is often a “gadget guy.” You look for cool things to buy and hang on your belt or to stockpile in your car. Since knives are rarely issued to patrolmen, selecting one could be an important and fun endeavor. My feeling, at the time, was that the Buck 110 was a bit conventional and rather heavy at 7.5 ounces, so I went looking for an alternative. Enter the Kershaw Black Horse. The BH had the same 3.75″ blade length as the 110, but dipped the gun belt less at a reasonable 4.5 ounces. Another plus in the Kershaw’s column was its ergonomic handle. It had deep, secure finger grooves and a welcoming rubber-like grip. I thought it was high-tech when compared to the flat rosewood slabs and staid brass bolsters of the Buck knife. 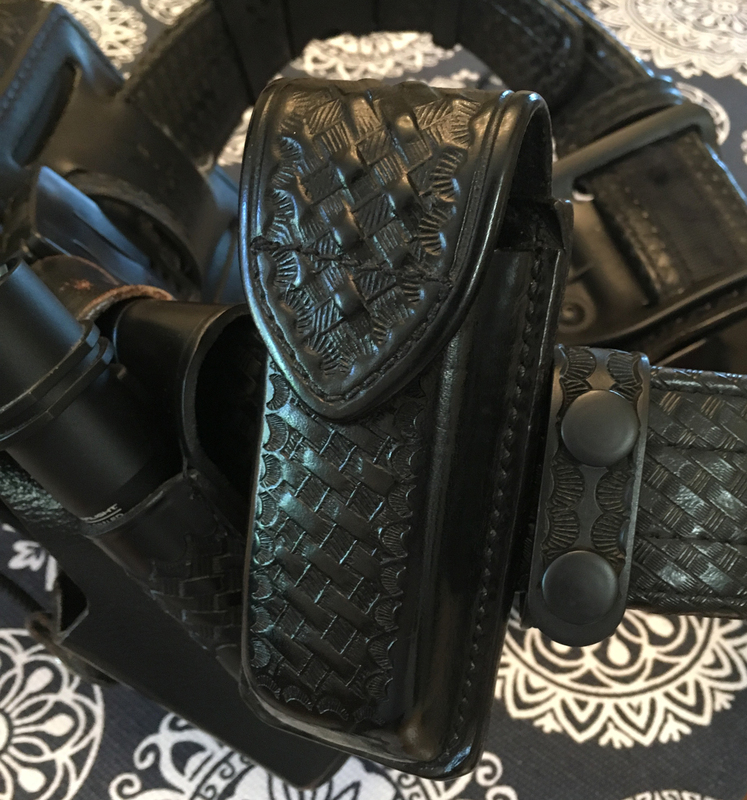 I bought a Don Hume double-stack, single mag pouch in basketweave to match my rig and situated it at 8 o’clock on my waist. I was told that a knife should be accessible with your weak hand (that’s what it was called back then) in case you needed it while your strong hand protected your firearm. Since no one was selling add-on opening studs back then, you had to perform what is called a “thumb wipe” to unfold the knife with one hand. Just as it sounds, you pinched the blade open with thumb and forefinger then pushed with your thumb against the main bevel of the blade and forced the sharp part open by friction. It was not exactly reliable or safe, but I practiced and felt I could manage when it would be necessary. 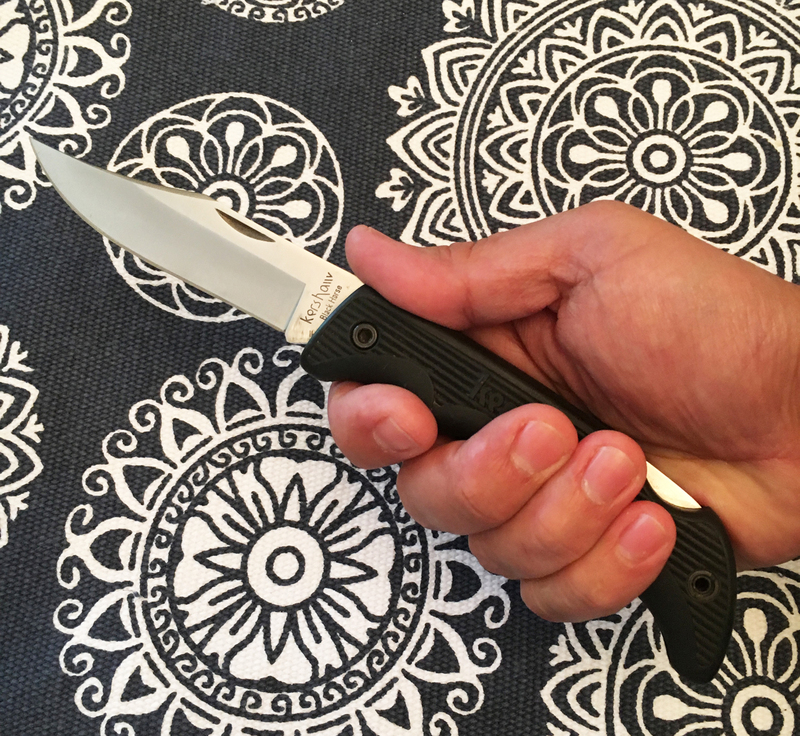 I happily carried that Black Horse for years until I fell in love with the later craze: one-handed opening folders with…gulp…pocket clips! A drawer full of knives came and went. Fast forward to 2017. Going back to the street again, I assessed my uniform choices and decided that a pocket carried knife was no longer my speed. 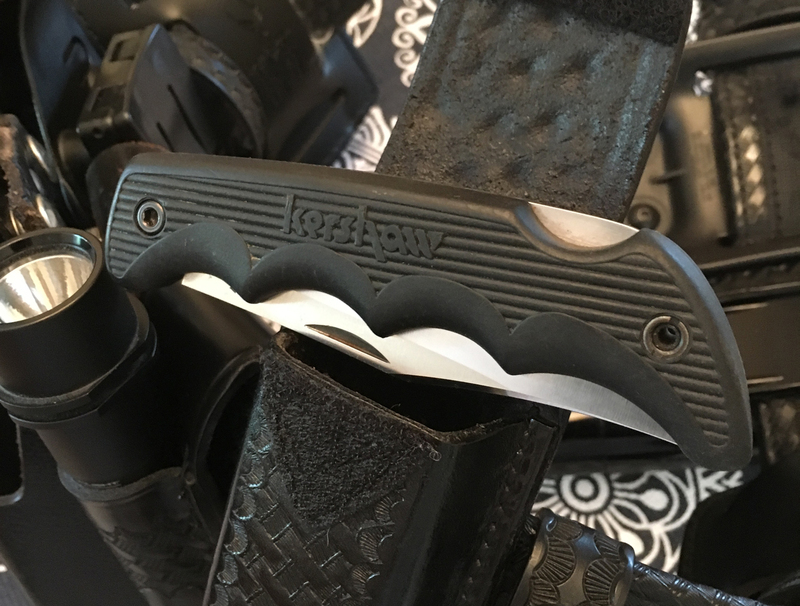 When I left the Road three and a half years ago, I was toting a Coast Knives’ Rapid Response 3.0 folder in my support-side pocket. I liked that it had a locking switch and was an assisted opener. Heck, I even met the designer, Ron Lake, at SHOT Show a few years back and thanked him for my duty knife. Because of its mechanism, if someone other than me grabbed my Rapid Response, I would have time to deal with them long before they figured out how to open the blade. 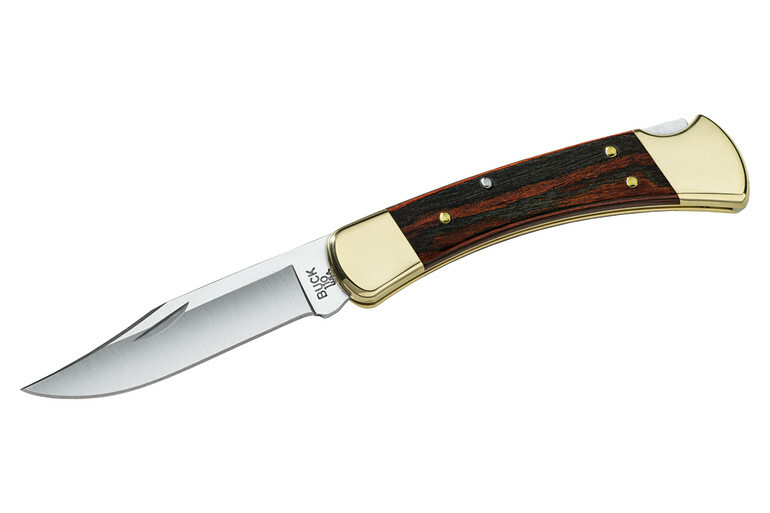 But after almost three decades, I wanted to go back to the belt-carried folding knife. I dove into my dusty locker and found that original basketweave holder that was my first knife pouch. It was still in great shape. I owe that to many, many preserving coats of black shoe polish. But what to put in it? As much as I liked the Black Horse, it was still not a single-handed affair. For old times’ sake, I pulled out the BH and did a thumb wipe. Nuh-uh. No, not for duty. I fished around for a knife that would properly fill the leather pouch’s generous dimensions. I settled on a trusty Benchmade AFO that had been in my SWAT kit. The AFO rides well without slop in the leather and comes to attention with authority via its auto-opening button. Problem solved. I just had to thread the holder onto my gun belt, insert said Benchmade, and log in for my first shift back on Mids. 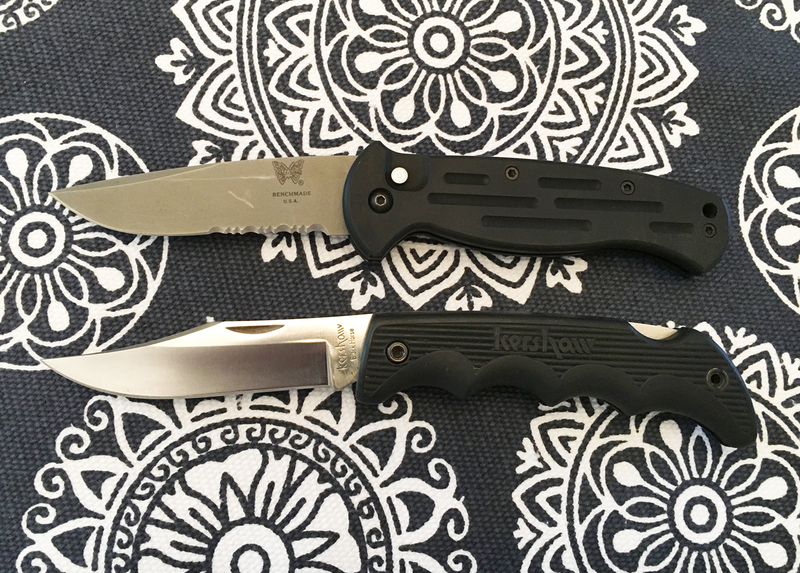 I am glad I kept that old Kershaw Black Horse because it is a reminder of how things in life evolve, even the little details, such as what cutter goes to work with you. This entry was posted in Knives, Street. Bookmark the permalink.